On September 28th, 1924 three aircraft touched down at Sand Point Washington to complete the first circumnavigation of the globe by aircraft. The aim of our project is to fly a reproduction of one of these aircraft, dubbed Seattle II, around the world in celebration of that epic and historic first leap around our planet. To that end we have constructed a reproduction of one of the original aircraft to make the journey. The 1924 Douglas World Cruiser was, in itself, a successful and durable design, and became the basis for several follow-on contracts with the Navy and commercial operators. 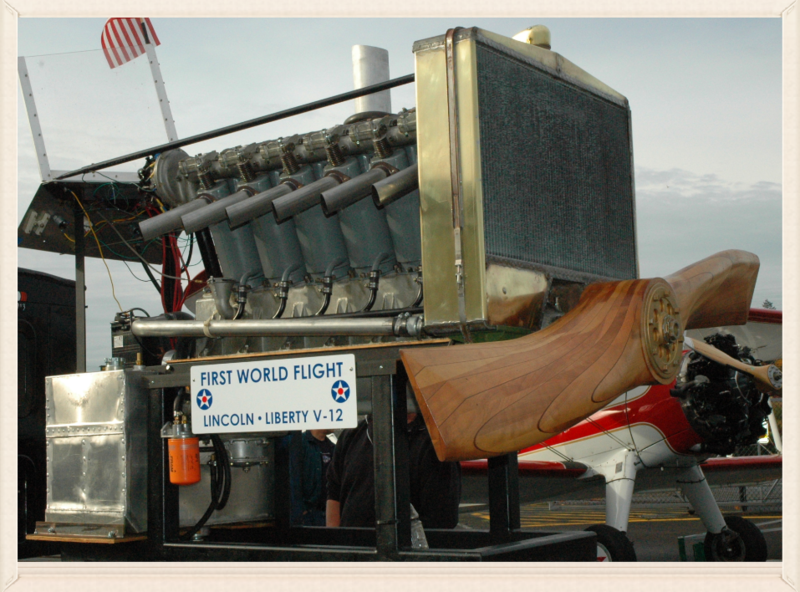 The Seattle 2 is powered by the same type of engine that powered the original Cruisers; a 400 HP Liberty V-12.engine. Many consider the engine to be the most important contribution the United States made to aviation technology during World War I. It was designed in just 6 days by Jesse G. Vincent of Packard and Elbert J. Hall of Hall-Scott in mid-1917 for the U.S. Government. Automakers Ford, Lincoln, Packard, Marmon, and Buick produced 20,748 Liberty 12s before the Armistice. The engine also powered the first aircraft to cross the Atlantic, the Curtiss NC-4, and the first plane to make a nonstop flight across the U.S. a Fokker T-2. Another major area for upgrading was the fuselage. The Douglas World Cruiser of 1924 was a redesign by Donald Douglas and Jack Northrup of a successful Navy torpedo-carrying float plane. In this transition, the fuselage moved from a combination and-wire-trussed wood affair to an all-tubing assemblage with some adjustable metal tie rods. We replaced the tie rods with tubing. Ease, cost, strength, as well as reliability of modern materials and methods, motivated this use of a unified fabrication approach. Where the original aircraft had a basic electrical system for starter and running lights, we've added to this a state-of-the-art avionics package, as required in the international aviation environment. To accommodate modern landing facilities, we've replaced the tail skid with a wheel and installed brakes on the main landing gear. Edo metal floats with water rudders will be used instead of the original non-steerable wooden pontoons. Durability of metal floats and better hydrodynamic design will better serve the Seattle World Cruiser on its world flight. The original aircraft's cover material was cotton. This fabric was organic and the paints used were very flammable. When wet, the cover would sag and distort the airfoil. The water also added considerable weight to the aircraft, degrading performance. In the sun, the old fabric would dry out and tighten, again distorting the airframe. Additionally, the original fabric was prone to rot, requiring replacement many times during an aircraft's lifetime. New materials and processes have led to the development of long-lasting, durable covers and finishes, which are non-flammable. We have extensive research materials, both historic and structural. We've been working from original drawings and photographs. Our building approach has been guided by the philosophy that the success of the world flight will be based on reliability and safety. One of our goals in this process has been to maintain visual authenticity. We've used all aircraft certified materials, hardware, parts, and accepted aviation techniques in every aspect of construction. For example, we've employed 4130 aircraft steel tubing, aircraft quality glues, modern fabrics, non-flammable paints, and certified "AN" hardware and fasteners. Other elements that constitute reliability and safety concerns have been chosen for their history and suitability to these goals. We have developed a fabrication and assembly checklist that has been used in conjunction with our building schedule. This process continues to be documented with photos and logbook entries which correlate with inspection sign-offs. We are fortunate to have assembled a unique staff of FAA certified mechanics and inspectors, assisted by aircraft builders and designers from the commercial, experimental, and antique aircraft restoration fields. With this highly skilled, motivated and dedicate team, the Seattle World Cruiser has been able to proceed safely and confidently as we undertake out world flight. Please join us in celebrating this unique historical event. Diane and Bob at the rollout and christening of the Seattle 2 at Boeing Field.